Easing the interaction by using visual interface elements instead of a syntax that needs to be learned and remembered is a fairly common principle ("recognition rather than recall") It is a major step forward if the interface is (hopefully) self-explanatory instead of having to read the ***** manual – first for learning and hereafter for remembering, if you did not interact with the system for a while. However, recently an improvement that took away the burden of the syntax brought me other problems in exchange. And not the nerds were complaining. Actually it was the very opposite. 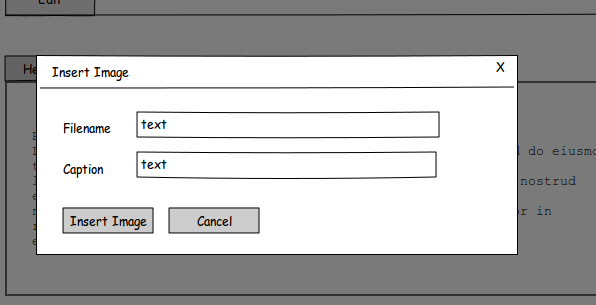 I was happy to see that the current Wiki-Editor has dialogs for inserting a picture. They are fairly simple, having no visual selection for a media library. But instead of remembering the Syntax, one can put in the file name and caption and generate the link to the picture from that. So what I thought want along the lines of this: The user often forgets the syntax (as my tests strongly suggested) so I would like to take the need for this. The dialogue shows the possibilities of the syntax, you need just put in your values, click o.k. and there it is without the hassle of recalling the syntax. So I did some tests. And it turned out it had some side effects: The simple interface that ought to suggest putting two values in and clicking o.k. to get a correct link generated was thought to have some more capabilities. Seemingly the dialogue suggested other stuff too, namely uploading pictures by drag and drop – which did not work at all, and left the users wondering about it. Seemingly, the functions of flickr and facebook already established drag and drop fairly well (brief remark: it is not very practical actually imho, as you need to rearrange and call up two windows). And they combine upload and image use, making these two steps one. So my idea to add some visible, interactive representations of (existing) functions were not wrong. But they were mistaken for being far more. That they did not work this way was the cause of trouble. So the overall usability may not have been improved at all and one problem was put in place of another. But as the idea still makes sense, I'll redesign the dialogue to make it's capabilities clearer and to anticipate it's use as a upload dialogue.